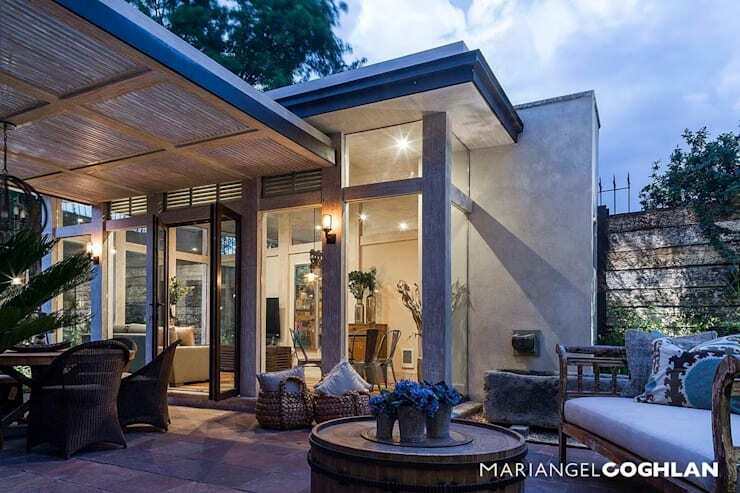 The modern family home has never looked so good as this gorgeous, oak masterpiece by Mexican Interior Architects Mariangel Coghlan. Every angle and detail of this home has been scrutinised, with beautiful touches from ceiling to floor. Cushy, inviting, warm and earthy, this is the kind of space that designers dream of. It combines style with a family look and feel, achieving the kind of tastefulness that only the very best often get right. The theme of oak and wood transcends throughout the house, used in a variety of ways that is neither too over the top nor too jarring. Each room is a delightful blend of colour and class. This style is one that could find its way into any South African neighbourhood and suits the lifestyle of any family—from kids' birthday parties to Saturday lunches on the lawn to fancy dinner parties. Follow us on a journey through the grandeur and experience a little bit of magic. From outside it's clear to see that the designers have not faltered in between the interior and exterior. Their attention to detail is meticulous as is their ability to truly transform something simple into something quite lovely. This outside patio area has been transformed into a warm, inviting space filled with comfortable benches, tables and chairs and flowers. Plants are used throughout the area to add natural colour to the space. The rest of the furniture as well as the walls of the exterior are earthy, neutral tones, blending into the oak wood theme of the home itself. A stone water feature resembling a bath rests on the left of the house as you can out of the large doors, adding a bit of character and charm to this modern family home, while maintaining the very natural look and feel. With soft lights and puffy cushions to sit on, this is a wonderful area for hot, summer nights enjoying a braai or gentle afternoons appreciating the quiet. The dining room is our first taste of class and style in this lavish home, where a grand wooden dining room table is surrounded by cushy purple chairs that look as comfortable as armchairs. A gilded mirror watches over the room, while gorgeous lanterns hang from the ceiling. 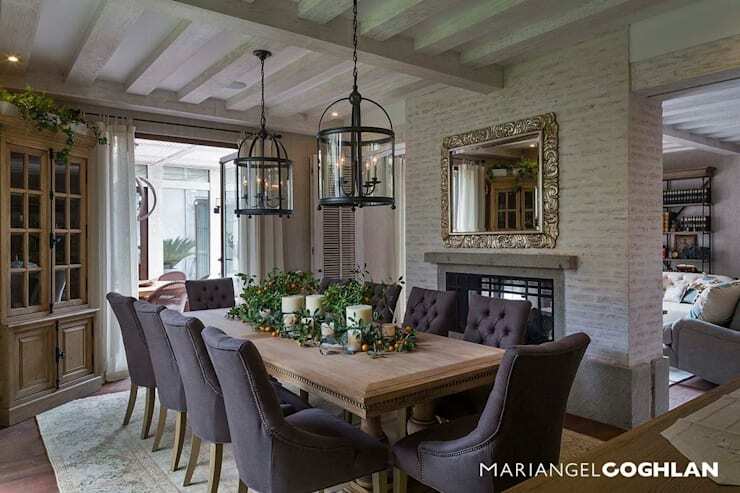 This is a dining room where every detail has been considered, from the candles and fauna that decorate the table to the beige walls, where the designers have gone for a rustic look and feel. The rustic walls collides with the detailed, luxurious furniture, creating a wonderful balance between prestigious and practical. It's also clear from this angle that the home celebrates an open plan style, with doors that open out to the exterior of the house and rooms that sweep into one another. Open plan allows the adults to keep an eye on the kids during dinner parties and guests to talk to the host while he or she tosses together the salad. In essence, open plan is the epitome of a warm and social family home. This isn't a living room where you put your feet up on the sofa, with beautiful earthy tones used throughout, carefully positioned cushions and delicately placed ornaments and accessories. Coffee mugs should remain on coasters and feet should be kept firmly on the floor. A gorgeous, antique-looking wooden coffee table is complemented by the beige tones of the sofas and arm chairs that surround it. The cushions add splashes of colour, but these colours are also toned down—coppers, blues and greens. This is a living room for appreciating the finer things in life such as china tea cups, orchids and elegant design. While a family home, this isn't the type of living room frequented by the kids. 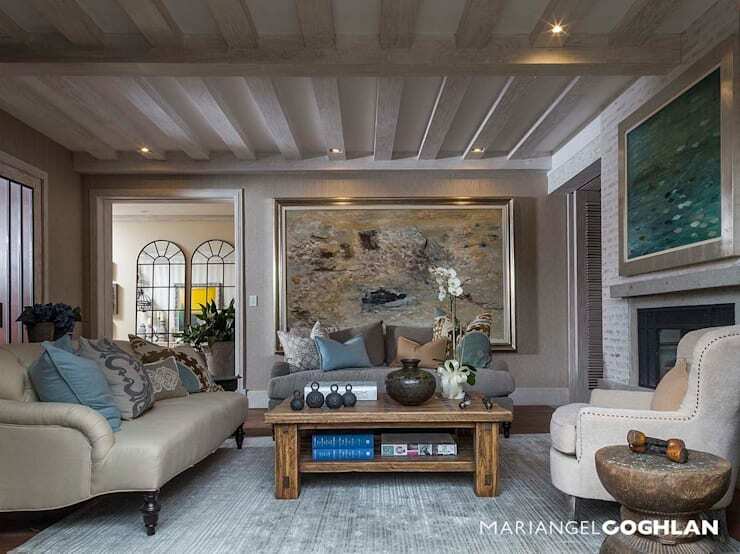 The artwork has also been well-considered throughout, adding a classy edge to the very neutral room. Colourful leather-bound books are positioned carefully beneath the coffee table, giving the room an air of intellect and tastefulness. 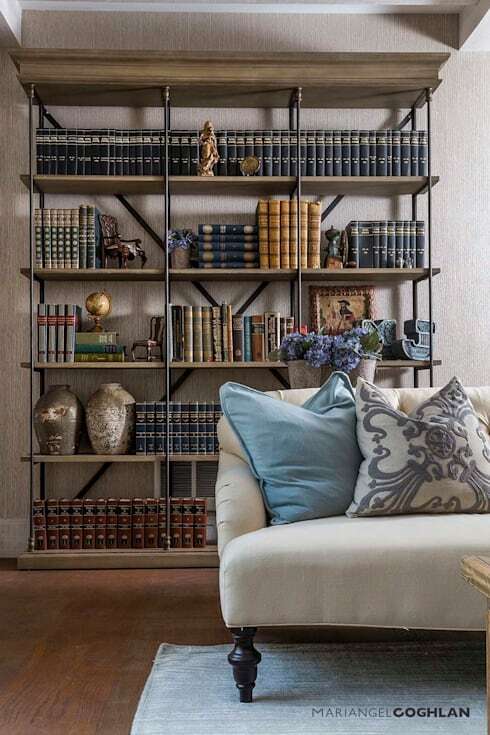 From this angle, it's evident that more leather-bound books are used as décor items in this home and in this living room, positioned on a simple and elegant bookcase behind the sofa. The books are skilfully placed, grouping colours but shying away from a boring look and feel. Instead the books are interspersed with antique-looking vases, ornaments and picture frames. This creates an ambiance of history and heritage. Colour has been added to the room in the most classic of ways—vases of flowers. Every detail has been considered, amalgamated into a design masterpiece of colour, style and taste. If this beautiful array of culture and trend appeals to you, you should also check out: A Surprising 1920s Home In The Suburbs. 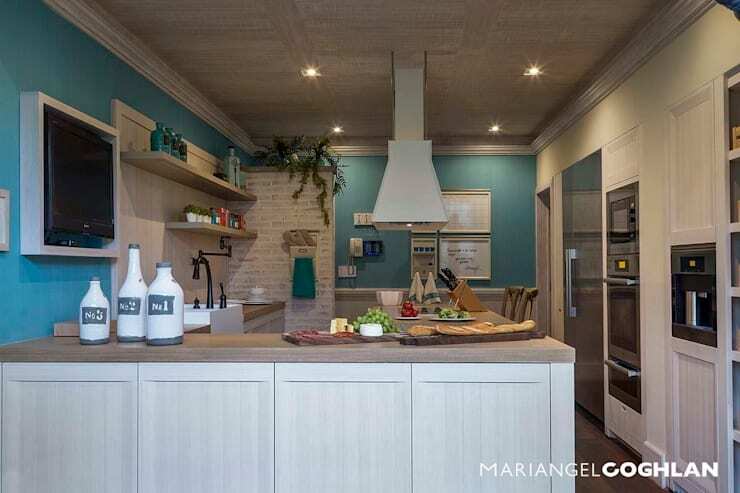 The kitchen is a less formal space, although wood is a beautiful and neutral feature throughout. Blue walls lighten the mood, adding colour and texture to the room. With a little table and chairs in the kitchen, it transforms into a space of laughter over breakfast in the mornings and concentration over homework in the afternoons. The kitchen is also designed to be open plan, allowing it to flow into the rest of the home. The person responsible for cooking is not isolated from the rest of the house. Snacks can be shared over the counter and conversations can be enjoyed while preparing the night's meal. The designers have included a bit of greenery in the kitchen, adding more colour and texture to the room in the form of plants. This gives the kitchen a very modern look and feel. The kitchen lighting has also been carefully considered, with soft down lights accentuating the walls. Here you can see the little breakfast table that is positioned just outside of the open plan kitchen, which opens up onto wide glass windows that transcend the barriers between the exterior and the interior. These windows allow for an abundance of natural light to filter into the room, providing warmth and sunshine without any artificial stimuli. The designers have ensured that this glorious window is the main event, where very simple and natural furniture and finishing touches are used in this specific area. The designers have positioned a colourful vase of flowers on the table, again transcending those barriers between the outside and the inside of the home. Oak is definitely a theme here, with contrasting dark and light wood complementing each other. A modern and trendy glass lampshade and light hangs down in the centre of the room, contrasting the country look and feel with an element from the city. 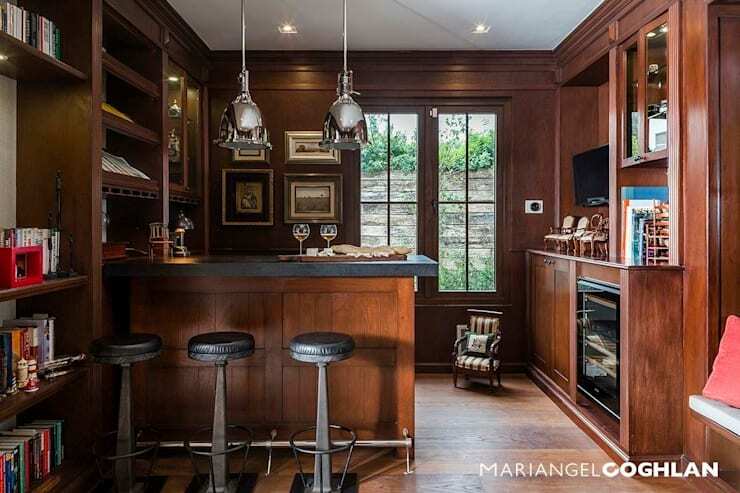 This home also features a gorgeous wooden bar and library area for after dinner cognac and winter mornings reading with a mug of steaming coffee and a book. The designers have not held back in terms of the use of wood, utilising a rich, chocolate coloured tone throughout. Comfortable bar stools are perched below the bar, providing a casual comfortable sitting area for those in the room. Shelves of wine and spirits rim the perimetre of the room, displaying labels and types. This is a library of cigars and fine alcohol, meant to be admired and enjoyed. The designers have broken up the intense use of dark wood with a beautiful French window that opens up onto the garden, allowing the room not to become stuffy or claustrophobic. While unseen from this angle, the rest of the room is made up of a beautiful and cushy library. This room is the epitome of leisure, showing how the home is a little bit more than a simple family space. This upstairs living room is far more relaxed and casual than the downstairs living room, transformed into a space that is more kid friendly and family orientated. A futon allows for lazy movie days and a throw draped over the ottoman represents comfort and snuggles. A magazine rack symbolises the move away from the intellectual books and encyclopedias found in the downstairs living room to a more frivolous and fun area. 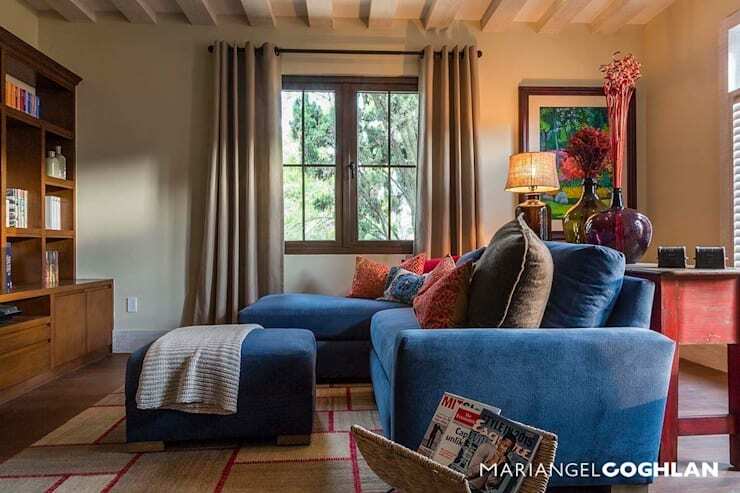 The designers haven't relaxed their taste and style, however, adding colour to the room in the form of deep, blue covers for the sofa and ottoman. Cushy pillows bring in bright reds and oranges to the room. Even the rug adds some rich reds to the room along with some bold patterns. Natural light streams into the room via large windows, which are framed by thick curtains that can be pulled closed to add coziness and warmth to the room. Bright paintings, flowers and lamps keep style of the room looking bright and vibrant. A glimpse into a bedroom shows the theme of oak continued, with this bedroom featuring a wooden headboard with large, trendy drawers at the base of the bed. 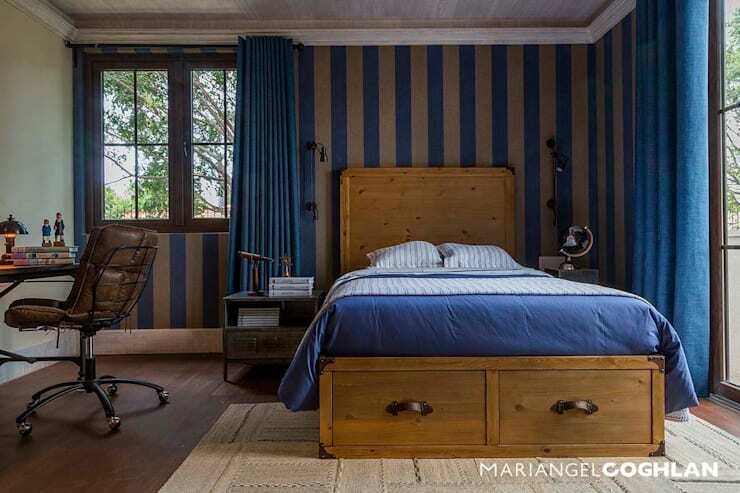 In this bedroom, the use of wood and earthy tones have been offset with the colour blue, adding almost a nautical look and feel to the room. Natural light is another factor, with large windows opening the interior of the room up to the exterior. The furniture is also of high quality, evident by the sturdy side tables, the beautiful leather desk chair and the desk featured in the room. Class and style transcend every single room throughout the house. The oak house is the most beautiful home, designed for families who enjoy a bit of comfort and a bit of luxury. This is the type of home that any South African would enjoy living in. It's so hard to choose but which room was your favouruite?